1990: 100-90-100 = 290 points. 22/09/1990: 96-92-98 = 286 points. Boris von der Weyermühle passed the Körung 'for life' with highest possible ratings for hardness and working drives (very high protection, fighting spirit, courage and hardness with middle sharpness) and lived to 10 years of age. His litter-brother, Bingo von der Weyermühle, also passed the Körung 'for life' with highest possible rating for hardness and working drives and lived to 10 years of age. Their sire, Akim von Vaciweba, passed the Körung 'for life' with highest rating for hardness and working drives. Gero: SchH 3, FH and passed the Körung 'for life' with highest rating for courage and working drives. He is sire of the vom Merkureck “C” litter (Condor); vom Tschirgantblick “I, H, J” litter (Igor); vom Blitzkrieger “D” litter (Dax); Jotunheim's “H, P, S” litters (Ivar, Grimer). 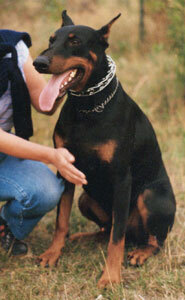 Djenna: SchH 3 and dam of the von Ambassador “A, B, D” litters (Djenna). Dajen: dam of the von der Mooreiche “J” litter. Hanko: SchH 3 and passed the Körung with highest rating for hardness and working drives. Hera: dam of the von Kraichgau “C” litter.